← Mohenjo Daro: A 155-minutes long fancy dress competition! When a pair of destitute brother and sister is left at the mercy of a heartless relative, the only solace they can find is in one another. They are somewhat like Hansel and Gretel but with no crumbs to strew the path, no home to trace back to and no parents to return to. Nothing can possibly be more horrific and in an irrevocably cynical world, they’d stay lost forever. But in Raj Kapoor’s Boot Polish, hope is both a stimulant and strength. 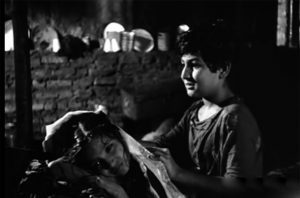 Orphans Bhola (Rattan Kumar) and Belu (Baby Naaz) have no alternative but to obey their belligerent aunt and beg for a living. Oblivious to the gift of childhood, survival is all they know. Yet, waggish and artful, they’ve learned the tricks of the trade and implore the passengers in Mumbai’s ever-swarming local trains or rushing passer-by’s on streets for a”dhela” or two. Bhola is the older and responsible one whereas Belu is as precocious as they come. 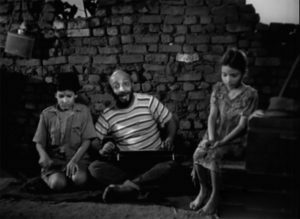 While Rattan Kumar conveys the sensitive disposition of Bhola, plucky Baby Naaz and her uninhibited, smart-alecky zeal steals the show. The child star even received a Special Jury mention at the Cannes Film Festival for her impressive work. Around its leading pair of kids schooled in the art of outsmarting, Boot Polishexamines the business of begging and bargaining, its disturbing creativity in juggling handicaps and guilt tripping with humour and irony. More than five decades later, the imagery, now even more precarious, plays itself out in Danny Boyle’s Oscar-winning Slumdog Millionaire. Dwelling in one of the rundown shanties by the railway tracks, their only source of comfort is David’s benevolent bootlegger John Chacha and his brand of motivational music — Nanhe munhe bache teri mutthi mein kya hai, Tu badhta chal and Raat gayi phir din aata hai. Inspired by his counsel to strive for dignity in labour, they decide to quit begging and save money to buy a boot polish kit. In a world where they’re constantly dismissed, disparaged and thrashed, purpose is akin to a brand new toy, one they cannot play enough. A heartrending scene underscores this amply after a phony astrologer rudely brushes off Bhola’s request to learn his future as”jootiyan ragdega.” Too naïve to recognise the contempt in his so-called foresight, Bhola exults over the impending fulfilment of his most desired wish — boot polish. When it finally happens, the brother-sister duo happily exclaims,”Aaj se apna Hindustan azaad hota hai” revealing how freedom is interpreted among the underprivileged. Little does he realise that accumulating tools is not enough, one needs skills too. A series of misadventures at Wadala Road station leave Bhola disheartened but Belu convinces him to not give up. A round of lessons from John Chacha in better salesmanship — Thehar zara o janewale, babu, mister, gore, kaaley. Kab se baithe aas lagaye. Hum matwale polishwale — benefits their cause considerably until his arrest and monsoon play spoilsport. In a nasty turn of events, Bhola and Belu are separated from each other. At this point, Boot Polish slips into contrived territory to accommodate Belu’s good fortune when a wealthy couple adopts her whilst overdoing the melodrama to stress on Bhola’s bad luck. He languishes, she flourishes; the ensuing contrast is pertinent but mawkishly portrayed before arriving at its dramatic conclusion entailing a chase amidst trams and cries, all the way from the erstwhile Victoria Terminus to Gateway of India. Hindi films tend to advertise the fervency in relationships by spelling them out repeatedly. But in Boot Polish, the deep affection between the siblings is evident and unaffected, sans the mandatory Bhaiya/Behna song to tom-tom their bond. 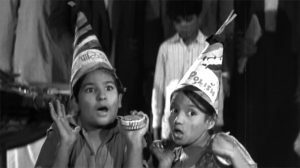 As the fifth film produced under the RK banner, Boot Polish shares its neorealist soul with the showman’s early and most acclaimed works like Awara, Shree 420 and Jagte Raho. Except it’s directed by his assistant Prakash Arora. Undeniably, the RK imprint is all over. Be it in the lyrical narrative unfolding like a thought-provoking musical or 420 tacked on David’s prison uniform. Apparently, the original cut of Boot Polish did not feature any songs but after the failure of his previous production, Aah helmed by Raja Nawathe, he didn’t want to take any risk and assigned his favourite composer duo Shankar-Jaikishan to whip up a soundtrack on short notice. As rich as the music and the philosophical thoughts weighed in may be, some of them feel quite unnecessary in retrospect. Like David’s Tansen parody Lapak jhapak tu aa re badarwa rendered by Manna Dey or the maudlin Tumhare hain tumse daya mangte hain. When this black and white classic released in 1954, India was caught in a post-Independence frenzy. There was tremendous optimism among leaders, citizens and filmmakers relating to its reform and progress. This strong sense of idealism is what abates the darkness of Boot Polish as well as makes a convincing case for the upliftment of the underclass. 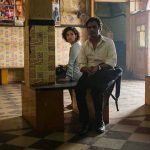 Boot Polish is a poignant celebration of tender persistence and sibling love where Bhola and Belu find their way back home, one far superior to the one they’d started from. 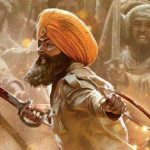 Yet the irony is that thousands of Bholas and Belus continue to wander the city in tattered clothes and dashed hopes and no happy ending in sight. This entry was posted in Classics, Columns & Reviews and tagged baby naaz, boot polish, cannes, david, prakash arora, raj kapoor, rattan kumar. Bookmark the permalink.